The Vital Records Office provides eligible applicants with copies of birth and death records that occurred in Monroe County from 1880 to the present. 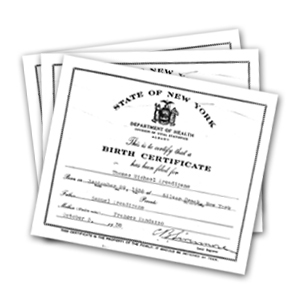 Click here to order a copy of a birth or death certificate online. Hours (excluding holidays): Mon - Fri: 8:30 a.m. - 4:30 p.m.
Last Saturday of each month: 8:30 a.m. - 12:00 p.m. at the Greece DMV branch located within the Mall at Greece Ridge (except during the months of November and December). Limited records are available at this site. Certified copies of birth and death records are processed while you wait and with few exceptions, take a matter of minutes. During peak business hours applicants may incur a longer waiting period. Genealogy requests may take four (4) to six (6) weeks to process. Monroe County charges $30 per certified record. You may pay with cash, check, money order or credit card. Checks and money orders must be made payable to Monroe County Vital Records. Genealogy copies are not available for same day pick up at the Vital Records Office. However, we can accept your payment and application at the counter. Your record will be mailed to you when the research has been completed. We discourage third party pickups. If you are unable to come to our office yourself, we recommend that you order your certificate by mail or via the internet or telephone. Provide the third party with a signed, dated and notarized letter stating who will be picking up your record, which record they will be picking up, and that you grant them permission to get the record for you. Send a completed and signed application form with the third party. You may download the appropriate form from the mail order page. Complete, print and sign the application form. The person picking up your record will be required to provide proof of his or her identity following the same criteria as listed above and will need to co-sign the application form. Any discrepancies or a failure to fulfill all of the above requirements may cause the Vital Records office to be unable to issue the record to a third party.